In the last few years, there has been some innovative technological advancements in the world of facility management. Technology has contributed to the efficiency of the industry by reducing the chances of error and definitely, more cost effective. This is the reason why it is crucial to keep an eye on the various technologies that would be able to mark the greatest impact on the operations of facility management. BIM or Building Information Modelling is an instrument used by various architects and contractors for development and scaling of different virtual models in building different projects. It offers the building operators as well as owners to have a comprehensive visual model of the facility much before the process of construction takes place. Though BIM is not a new name in the realm of facility management, it is becoming quite a commonplace idea. Experts in the field are now able to realize the power of these instruments for accessing important data and project delivery. When BIM is integrated with the existing work order programs and facility maintenance software, the expert team is better able to retrieve the operation and management manuals, floor planning and asset information. Though BIM is still in its nascent stage, business organisations are now able to understand the importance of improving collaboration as well as communication between various teams through the visual modeling. The Internet of Things or the IoT refers to the network of devices which can be accessed via internet and utilized by the business facility. This service depends on several tools such as thermostats, sensors and actuators for the evaluation of data and reducing the amount of time and energy required to manage those tasks. Each of the deployed sensors in the device can pick up the data in a specified building for better informing the team of current light, vibration, sound and temperature in various areas of the building. This phenomenon can be explained with respect to the human body. In simpler terms, when the communication between the different body parts is improved, it would better result in the health of the person and promote cohesive functionality. When the IoT system is utilised to its fullest potential, the energy bills are much reduced and it offers an insight to the happiness and fulfilment of the occupant of the building. But the present challenge in deploying the IoT lies in its connectivity costs. When there is no common hub which can integrate the devices into it, it will not be possible to aggregate the facility data into the required actionable metrics. This technology will develop even further in the coming days and it will be invariably integrated within the frame of the smart buildings in the future. Considering the requirements of large facilities, having an advanced HVAC system goes a long way in keeping up the efficiency of the building. Technical advancements along with implementation of eco-friendly ideas has led to the improvement of HVAC systems. The cost of heating and cooling within the facility can be reduced to a great extent with the aid of an advanced HVAC system which, in turn, would reduce the environmental footprint and benefit all around. HVAC facility along with building automation system or BAS has come a long way for reducing the costs of facility management. These programs are useful in saving costs as they notify the managers ahead of time when the systems are not in effective operation. This allows the building operators to steer clear of costly equipment replacement by solving problems even before they occur. The integration of these systems in the near future with the facility maintenance software would also be able to create and assign different work orders to the different team members. The primary struggle with the implementation of advanced HVAC technology is definitely the time and cost involved. Thus, it is advised to invest some time in researching on the return on investment before implementing a new building automation system. Without the assistance of a responsive facility management software, the experts are required to toil in rolling out paper blueprints, flipping through spreadsheets and relying on their knowledge and experience for running the facilities. When the document is not backed up by proper knowledge and skills, it would lead to dilemmas. This is a common issue at times, when the current facility manager leaves and a new person drops in. This lacuna can lead to an undesired effect on the building and expensive repairs. Also, when there is paper based work order, it could lead to redundancy, overlapping and duplicate entry of data. Automation can be deemed as the key to success in the future of facility management. These systems are competent in surfacing the requisite information as soon as a work order is created. This is a more productive way compared to the need of various team members wasting their time in collecting information and using it. Drones bring a brilliant opportunity in improving the efficiency in facility management. It is used for mapping the buildings accurately, identifying damages and providing complete security controls. The greatest innovation in this UAVs or unnamed aerial vehicles is automation and control. Also, robots are used for cleaning floors and building maintenance. It is also used for catering services and waste management. Though there is no chance of the complete replacement of human labour any time soon, yet robotics and automation is used for improving human efficiency with the aid of automated process. For instance, the tasks and work orders which are triggered on the basis of the workers’ location can be adjusted on the basis of the preferences, competence and skills of the user. When the maintenance of the facility is concerned, various technological advancements are currently taking a stride. 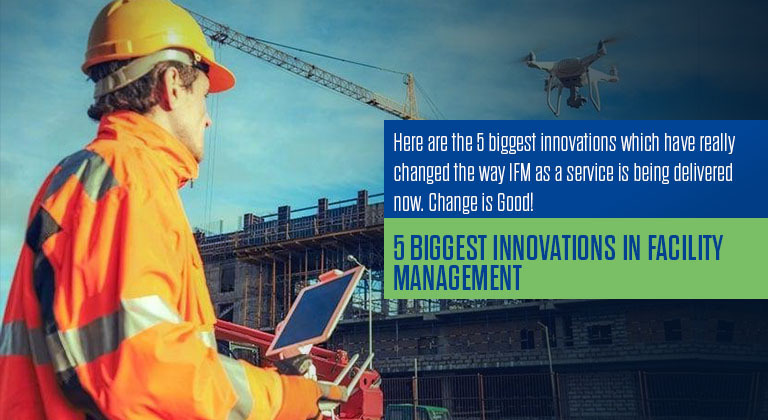 So, these top 5 emerging technologies will be able to make the greatest impact in the world of facility operations and the facility managers are working day in and out to bring about these positive changes in the recent future.